Uncertainty continues to play a big role in Game theory. In trying to make good choices, people have to use their own judgment and discretion rather than math equations, because math equations cannot accurately represent uncertainties within a situation. Last time, the professor first claimed that most games have a first-mover advantage, which means that people gain an advantage by strategizing first. First-mover advantage is a universally acknowledged truth and is common in a lot of settings, one of which is a chess game. In the picture above, the Elo Rating is a way of calculating relative skill level between two competitors. The average Elo Rating demonstrates how sophisticated both people are at playing chess. 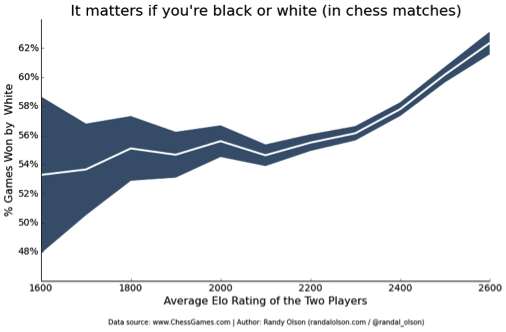 From the graph above, it is easy for us to deduce that by moving first (being the White player), he/she gains a significant advantage because the winning rate is significantly higher than for the Black player. The graph also implies that the higher the skill level of the players, the higher the advantage of being the White player will be. By taking an initiative, the White player can start developing the game towards his/her own advantage, while the Black player will always need to neutralize the White’s advantage to attain equality. If the White player makes a mistake, he/she loses initiatives. However, if the Black player makes a mistake, it will be nearly impossible for him/her to neutralize the difference. Sveshnikov wrote in 1994, “Black players cannot afford to make even the slightest mistake … from a theoretical point of view, the tasks of White and Black in chess are different: White has to strive for a win, Black—for a draw!” (69-70). Even though there is no mathematical proof that being the Black player can put one in a disadvantageous situation, observation and statistics nevertheless convey that the notion of first-mover advantage is true. The professor at the end of the class changed his argument and said: “There are even more games that have a second-mover advantage, so we should make our own judgments eventually.” Consider Rock-Paper-Scissors. People are destined to lose if they choose to move first. If someone chooses rock, the other player will consequently choose to play paper. Other situations can also exemplify the notion of second-mover advantage, such as going to a haunted house. No one wants to step in to a haunted house first, because the first person runs the risk of experiencing embarrassment by being scared by “ghosts.” However, the people who are following the first person will be able to anticipate what is going on as to avoid embarrassment. Furthermore, the second-mover advantage holds true when a company makes executive decisions. If a company wanted to invest in a new high-technology machine, it definitely would not want to be the first one to employ the new equipment. It wants to see other companies use the equipment first to further rely on the machine. Another question thus arrives: when should people choose to move first and when should people choose to move second? When situations get complicated, these questions become even harder to answer. For example, should my parents go to Shenzhen, a city with potential career opportunities, to develop when they have virtually no money? Should they run the risk of their lives to search for career opportunities or should they wait for ten more years until they completely miss the opportunity? Again, game theory will not give us direct answers. Game theory needs to be complemented with sociology and psychology in order to generate better predictions. Formal math equations that try to determine human actions and decisions will probably never be accurate, because of the existence of uncertainties. Adorján 2004, pp. 69–70 (statement by Sveshnikov dated May 12, 1994). “Chess Game.” Randal S. Olson. Randal S. Olson, n.d. Web. 5 Dec. 2014. “Haunted House.” Game Zone. Game Zone, n.d. Web. 5 Dec. 2014. 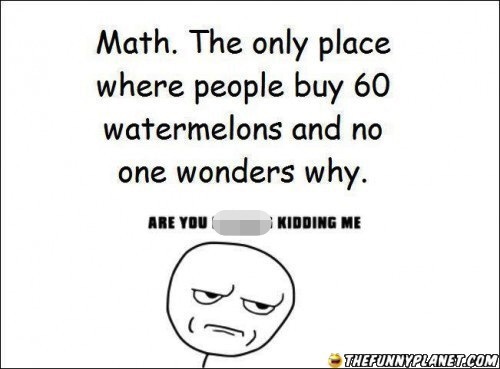 “Math Joke.” Joke All You Can. N.p., n.d. Web. 5 Dec. 2014. This entry was posted in Math and Technology and tagged Independent Seminar, math, westtown school on December 6, 2014 by joezhu2014.